Add this absolutely delicious flavorful dish to your food menu. Cooking this is so easy and quick. This is totally a time-saving recipe to make. Try this easy recipe today. 1. Preheat the oven to 350 degrees. 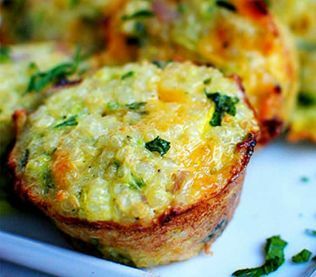 Place 12 silicone muffin cups on a baking sheet and set aside until ready to use. 2. Combine quinoa with 1 cup water in a medium saucepan and let the pan over high heat. Bring to a boil then reduce the heat to a simmer. Cover and cook until the quinoa is cooked through and the water is absorbed, about 15 minutes. 3. While the quinoa is cooking, slice the tomatoes, finely chop the onion and olives and set aside. Heat the skillet over medium heat, ad the oil and the onions and saute for 2 minutes. Add the tomatoes, olives and italian seasoning to the onion mixture and saute for another minute. Turn off the heat and set aside. 4. Crack the eggs into a medium mixing bowl and mix with a whisk or a hand beater until well combined. Add the cooked quinoa, vegetable mixture, cheese and salt to the eggs and stir to combine. 5. Pour the mixture in to silicone cups, dividing equally and bake until the eggs are set and the muffins are light golden brown, 30 minutes. 6. Allow the muffins to cool for 5 minutes before serving.